The states we spoke with consistently reported that cases involving immigrant families go more smoothly when consulates are involved from the early stages of the case. Involving the consulate from the outset can ensure the parents and children are properly represented and can prevent delays when permanency options are considered. Consulates can also assist with relative notifications so that federal notification requirements stemming from the federal Fostering Connections to Success and Increasing Adoptions Act of 2008 are met consistently. Given that 24% of all children in the U.S. have at least one immigrant parent, and that in all but a few states at least 10% of children in low income families are children of immigrants5, it is likely that most child welfare agencies have investigated child maltreatment cases in immigrant families and have at least a few immigrant children in care. In these cases, consulates for the families’ countries of origin should be part of the child welfare agency’s network of collaborators and caseworkers should understand what is expected of them in these cases. Whether collaboration is formalized in a memorandum of understanding or left informal because cases are few or leadership prefers less structured working relationships, consulates can be partners in assuring families understand the legal process with respect to their parental rights. In addition, through collaborations with consulates child welfare agencies can access assistance communicating with parents or relatives located abroad or can work together to build relationships within local immigrant communities around child safety and parenting issues. The policies and interagency agreements examined here vary widely and are illustrative of the range of measures in place to facilitate cooperation between child welfare agencies and consulates. There is no “one size fits all.” But by recognizing the range of what states and consulates have put in place in jurisdictions around the country child welfare agencies can consider whether such an agreement might be worthwhile to build cooperation with the consulates of whichever nation(s) are the countries of origin of significant numbers of children in foster care in their area of jurisdiction, and, if so, what sorts of provisions might be worthwhile to include. 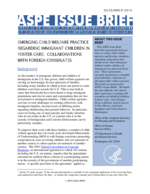 For jurisdictions with few immigrant children or children of immigrants in foster care, choices will be made regarding manpower issues and whether resources for training and establishing working relationships can be prioritized. The state officials we spoke to believed that their efforts resulted in better representation and outcomes for families, increased trust in immigrant communities, and better casework practice more generally. We heard that knowing how to reach out makes the contacts more efficient, and that cases go more smoothly when the consulate has been involved from the beginning. The efforts do take time and resources to establish. However, as the practice becomes institutionalized at the local level, we also heard that less state level involvement is needed over time. Many of the most difficult permanency decisions in the child welfare field arise when steps that should be initiated early in the case are skipped and questions are raised later in ways that delay permanency or result in heart wrenching choices about issues that should have been considered and resolved early in the case. Consular notifications can be helpful in keeping cases involving children of immigrants or immigrant children out of this category. Consulates can be helpful in the short term and consular notification may prevent complications if termination of parental rights is ultimately considered. However, notifications can occur appropriately only if caseworkers ask about children’s and parents’ countries of origin and are aware of their responsibilities to notify the relevant consulate if the child or the child’s parent is a foreign national, and when consulates are engaged as partners in assuring the rights of immigrant parents are respected while child safety is assured. 5 Migration Policy Institute Data Hub, Children of Immigrants under 18 in Poor and Low-Income Families, 2010, accessed October 23, 2012.